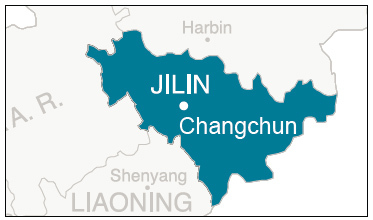 Changchun is the provincial capital of Jilin province in northeast China. Changchun is endowed with abundant natural resources, including petroleum, natural gas, coal, shale oil, limestone, and other minerals. It is also one of the most important grain production bases in China. In regards to industrial developments, Changchun is competitive in automobile manufacturing, food processing, applied chemicals etc. Changchun is developing its city layout in a longterm bid to alleviate pressure on limited land, aid economic development and absorb an increasing population. It has been planned that the downtown area will expand southwards to form a new city center around Changchun World Sculpture Park, Satellite Square and their outskirts, and the new development zone. Changchun is linked to the national highway network by the Changchun-Harbin and Changchun-Jilin-Huichun Expressways and the busiest section in the province, the Changchun-Jilin North Highway. This section connects the two biggest cities in Jilin and is the trunk line for the social and economic communication of the two cities. Changchun has three passenger railway stations. Both the East and South Stations are quite small and only local trains stop there. Changchun Railway Station is located at then north end of Renmin Dajie. Around 110 trains pass through or terminate at the station daily. It takes about eight hours to travel by train to Beijing, four hours to Harbin, and 10 hours to Dalian. Changchun Longjia International Airport opened in 2005 and serves as the main civilian airport for both Changchun and Longjia. It takes about 45 minutes to reach downtown from the airport. Domestic flights are available to 20 cities including Beijing, Shanghai, Guangzhou, Shenzhen and Xiamen. Currently international and regional flights are available to destinations including Hong Kong, Seoul, and Tokyo, but the airport hopes to create more domestic and international flights. By 2015, the new airport is expected to be capable of handling 6.5 million passengers annually. Changchun is a very compact city, planned by the Japanese with a layout of open avenues and public squares. Despite once having the most complex tram system in Northern China, there is now only one remaining route open. However, Changchun is notable for having China’s first urban light rail system, opened in 2002, which was developed from the existing tramway system. There is currently one line encompassing 14.6 kilometers of track with plans to expand the system to an eventual 179 kilometers of track. Changchun achieved a GDP of RMB 400 billion in 2011. Fixed asset investment, industrial investment, and domestic and foreign investment in actual use all achieved substantial increases of different levels. The city’s leading industries include foodstuffs, biology and pharmaceuticals, and automotives. Changchun is the largest automobile manufacturing base in China. As the cradle of the auto industry, and home to the FAW Group, China’s largest vehicle producer, one of Changchun’s better known nicknames is "China's Detroit". Changchun has great potential for growth, but like many northern cities it still is trying to resolve difficulties. It is increasingly faced with competition from nearby cities, seeing its dominance of the northeast as a regional industrial powerhouse diminish as other nearby cities continue to narrow the gap. According to a 2006 World Bank Study, Changchun ranks 53 out of 120 cities measured in terms of attractiveness for foreign investors. The city received an even worse score in terms of government effectiveness in attracting foreign capital, ranked at 79. The city has the highest taxes/fees structure of all cities in the northeast, at 6.8 percent of sales. Access by small domestic enterprises is very low in Changchun, at 16 percent (compared to 53 percent in Shenyang and 47 percent in Jinzhou). On the upside, confidence among firms that property and contract rights will be protected is quite high, at 70 percent, and labor overstaffing is very low, at 2.5 percent. Education levels are also relatively high, with 29 percent of workers surveyed having attained a university-level education. Han also noted that the government-planned development of the Changchun-Jilin-Tumen River Development Area has been incorporated into pilot zones and that the Chinese Tumen River Regional Area Cooperative Development Plan is proceeding. The 521 kilometer-long Tumen River acts as a boundary between parts of Northeast China, North Korea and Russia and is a crossroads for vital trade routes. The zone is one of the first 27 state-level advanced technology development zones and is situated in the southern part of the city, covering a total area of 49 square kilometers. One can find 18 full-time universities and colleges, 39 state and provincial-level scientific research institutions, and 11 key national laboratories within the zone. The zone is presently focusing on developing its five main industries, namely bio-engineering, automobile engineering, new material fabrication, photo-electricity, and information technology. Established in April 1993, the zone enjoys all of the preferential policies stipulated for economic and technological development zones in coastal open cities. It is located five kilometers from downtown Changchun, two kilometers from the freight railway station, and 15 kilometers from Changchun Longjia International Airport. The zone is devoted to developing five leading industries, namely automotive parts and components, photoelectric information, bio-pharmaceutical, fine processing of foods, and new building materials. In particular, high-tech and high value-added projects account for over 80 percent of total output. In 2011 the zone's total fixed assets investment rose to RMB 60.33 billion. Among the total of 1656 enterprises registered are 179 that are foreign-funded. The zone also witnessed a total industrial output of RMB 277 billion in 2007.